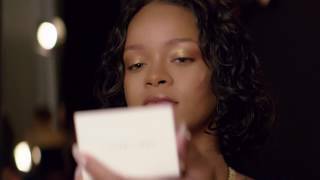 A FentyBeauty.com exclusive: Invisimatte Blotting Powder, Invisimatte Blotting Paper and Portable Touch Up Brush 130 join forces in one must-have set of mattifying essentials—for an instant filter effect that’s always on standby. Valued at $72, yours for $54. Don’t be caught without the perfect blot. Take it from Rihanna, who blots on the fly to stay photoready 24/7. This online-only mattifying trio brings together Invisimatte Blotting Powder with its perfect travel partner, the Portable Touch Up Brush 130, along with Invisimatte Blotting Paper to help you lift away shine while leaving makeup perfectly untouched. 1. INVISIMATTE BLOTTING POWDER: The translucent powder contains an exclusive pore-diffusing complex that absorbs shine and gives you a natural matte refresh for an instantly filtered look—so you’re always ready for a shine-free snap. The universal formula is completely traceless against all skin tones and won’t cake, clog pores, creep into fine lines, or disturb makeup. And get this: It extends the wear of your foundation, too. 2. 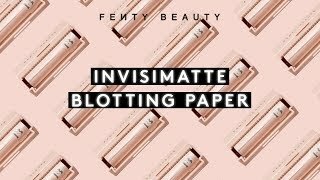 INVISIMATTE BLOTTING PAPER: Super compact, portable, and straight-up chic, these oil blotting sheets are beauty’s ultimate underdog with a serious makeover. Because—take it from Rihanna—blotting is key to keeping your makeup looking just-applied. 3. PORTABLE TOUCH UP BRUSH 130: Custom-made to pair with Invisimatte Blotting Powder, the brush has a retractable design and magnetic panel, so it snaps right in to the bottom of the powder compact, always there when you need it. Slanted, soft synthetic bristles provide extra surface area for applying Invisimatte—perfect for quick fixes and a mattifying, instant-filter effect. INVISIMATTE BLOTTING POWDER: TALC, SILICA, ALUMINUM CHLOROHYDRATE, SQUALANE, OCTYLDODECYL STEAROYL STEARATE, ZINC STEARATE, OCTYLDODECYL MYRISTATE, HYDROGENATED POLYCYCLOPENTADIENE, HDI/TRIMETHYLOL HEXYLLACTONE CROSSPOLYMER, CAPRYLYL GLYCOL, PHENOXYETHANOL, MANGANESE VIOLET (CI 77742), HEXYLENE GLYCOL. Dab gently to absorb shine, focusing on the T-zone, cheeks, chin and around the nose. Does your skin get extra oily throughout the day? Blot first with Invisimatte Blotting Paper and then dab the face with Invisimatte Blotting Powder using Portable Touch Up Brush 130. Double, with no trouble. INVISIMATTE COMPLETE ESSENTIALS is rated 4.7 out of 5 by 15. Rated 5 out of 5 by QualityResusQueen from All together this is an AWESOME set These products are all awesome! The translucent powder omg helps my face stay #FentyBeauty for 16+ hrs. The brush is great product as its smell enough to slip right into my makeup I carry with me to work, business meeting , and lunch date. I highly recommend this set! Rated 5 out of 5 by Anonymous from AMAZING!!! I loved everything that I got! have no idea how to clean the tools but I've been checking some YT videos on how to treat them well enough, other than that I'm pretty much in love with everything! Rated 5 out of 5 by David from Great set of products I've been using this set for a bout a month and I'm very happy with how it wears. It keeps my skin matte without looking powdery or drying my T-zone out. Will purchase again. Rated 5 out of 5 by ahloukitty from great value on this set getting them in a set like this gave me my money's worth..love them all.. Rated 5 out of 5 by Tiyana123 from In LOVE I love this duo ! I bought this in November and it works so well ! The invisimatte is actually invisible and not chalky white on us melanated girls. I appreciate the way that Rihanna thought about us when making this product ! It is the perfect quick fix for if your makeup starts to get oily. It makes sure your makeup can look perfect all throughout the day. Rated 4 out of 5 by Shakila94 from In love! I purchased this invistmatte bundle a month ago & I love it! The blotting paper is my favorite! I'm an oily girl so I get shiney in my tzone alot but the blotting paper got all the oil smudge free & didn't take my make up off. The pawder controls the oil a little longer but I'm not sure how to really use it. Rated 5 out of 5 by Leyley from BAM! I've dealt with oily skin, looking greasy n sweaty all my life. But this kit, doesn't matter how long it has been since I left the house, it mattefies and make my skin look beautiful again. 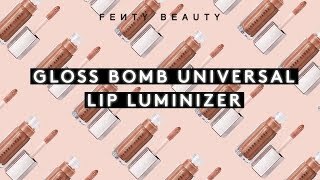 And everytime I do a full fenty face I'm amazed by how the products interacts, like they were really designed to be used together. And I'm feeling my pores and scars less visible after daily usage.